I am typically pretty OCD about getting workouts done on the day they are assigned or sooner if I need to make schedule adjustments. But delay them? Not if I can help it. But I decided to push Friday's swim to Saturday because my folks were still here and I wanted as much time as I could get with them. Plus the workout included a 1000y time trial that required some focus. Then Saturday I was so annoyed with myself for having postponed it, and having to do it after a scheduled run, that I felt very childishly grumpy. 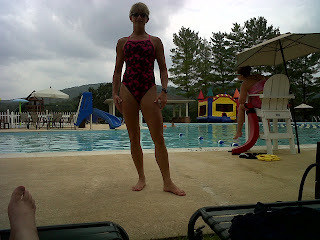 So I put on my happiest swim suit - the new pink flamingo one - and headed to the pool with the kids. I knocked it out under some heavy clouds that threatened to boom at any moment and end my swim early. Then like anytime I do something a bit begrudgingly, it went well and I felt SO much better afterward. Surely the new pink flamingo suit helped. Spencer snapped this picture not long after....see...no evidence of grumpiness! Swimoutlet.com had a big sale recently and I picked up two suits, including this one, for $15 each. It's simply impossible to be grumpy swimming in pink flamingos. Lifeguard Rachel is looking at the clouds rolling in! Training volume drops off considerably in preparation for the Luray Double this upcoming weekend. It's an Olympic race on Saturday and a Sprint on Sunday. At the same time, hubs and the kids are off for a big camping trip with friends. Then I'm home for three days, the kids will start school, then it's off to Burlington to meet my new Endurance Films Racing teammates and race in Age Group Nationals. It will be a crazy two weeks, but I'm ready for the ride!! Incidentally, Grant's Karate group did a demo at our town's summer festival. I'm super proud of him and put a short clip of some of his moves and his board breaking up on the family blog.